Providing you the best range of gold soft grip, gold flex and gold flex soft with effective & timely delivery. Gold Soft Grip discs offeredcomprise superior finished sanding disc that features optimal foam thickness as well as semi-open grain coating that provides for less dust clogging as well as optimum cutting performance. Further, it also come with soft backing support so as to achieve excellent paint finish. Some of its features include softer disc edge for effective elimination of damages on profile sanding; suited for applications involving marine industry, automotive refinishing, wood processing and on materials like paint sanding, lacquers among others. The pale coloured aluminium oxide abrasive is bonded to a flexible A-weight latex paper using a resin-over-resin process in a semi-open pattern, and then overcoated with a special sterate product that reduces clogging. Suitable for use on soft and hard woods, MDF / HDF, sanding paint, lacquers, plastics primers, soft and resinous woods, and veneers. The pale coloured aluminium oxide abrasive is bonded to a flexible A-weight latex paper using a resin-over-resin process in a semi-open pattern, and then overcoated with a special sterate product that reduces clogging. Suitable for use on soft and hard woods, MDF / HDF, sanding paint, lacquers, plastics primers, soft and resinous woods, and veneers. 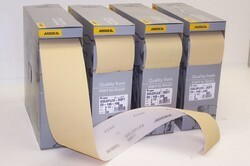 Mirka Goldflex Soft hand pads are supplied in rolls of 200 pads in the most popular grits P150, P180, P240, and P320. Gold Flex discs offered provide suitability for use on profiled surfaces and bearing light, flexible latex paper finish it is perfect for allowing dry sanding support. Further, the special stearate coating support also meet the demands of preventing issues of clogging and pill forming. Some of the areas it is suited for include marine industry, vehicles manufacturing, wood processing and can be made available in roll/sheet form. Some of its features include resin over resin bonding support; aluminum oxide gain with semi-open coating; grit range options of P150-P320, P400-P500. The pale coloured aluminium oxide abrasive is bonded to a flexible A-weight latex paper using a resin-over-resin process in a semi-open pattern, and then overcoated with a special sterate product that reduces clogging. Suitable for use on soft and hard woods, MDF / HDF, sanding paint, lacquers, plastics primers, soft and resinous woods, and veneers. 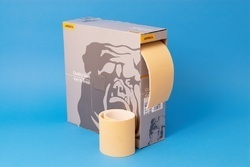 Mirka Goldflex Soft hand pads are supplied in rolls of 200 pads in the most popular grits P150, P180, P240, and P320. Gold Flex Soft discs offeredcome in soft and flexible finish and suit demand of hand sanding of profiled surfaces as well as irregular difficult-to-reach details. Finding extensive use in automotive industry, its grip friendly foam base allows for even pressure application as well as meet the demand of reducing risk of sanding through the surface. Some of its features include presence of special stearate coating for preventing clogging; suitable for both dry and wet sanding; suited for wood processing, marine industry, vehicles manufacturing areas; suited for materials like hard wood, paint sanding, plastics, primer, veneer; resin over resin bonding support; aluminum oxide grain among others. Looking for Gold Flex Soft ?